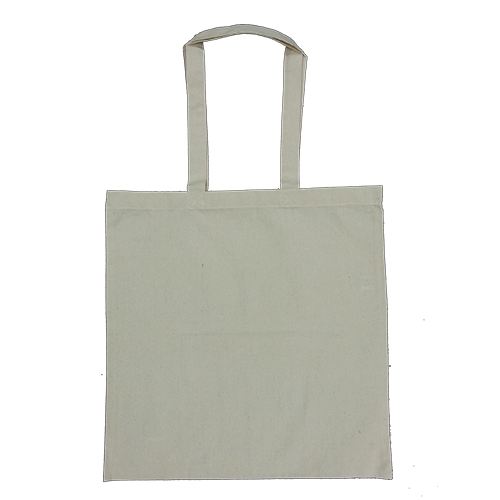 Flour sack towels have been used in households for generations for cleaning, cooking and other household tasks. 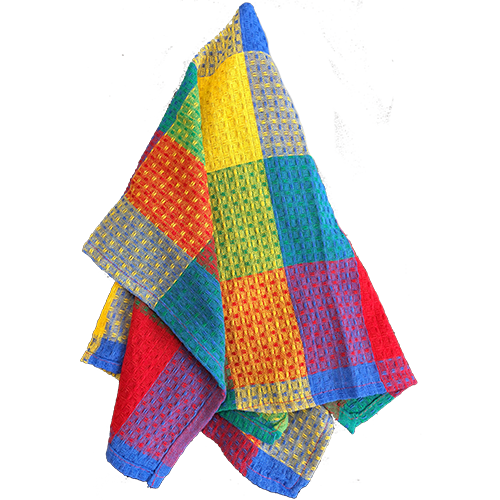 Made from 100% cotton, these towels are extremely absorbent and lint-free, making them ideal for removing dust and soaking up liquids. 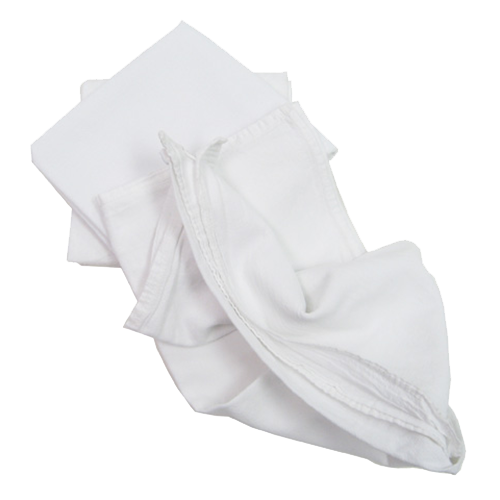 Flour sack towels can be washed and dried in the washing machine, making them easy to clean after use. However, to maintain their absorbing power and crisp white appearance, you’ll need to take special care throughout the laundering process. 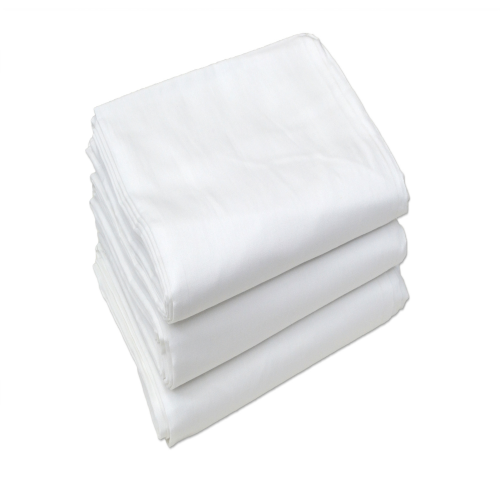 We have flour sack towel cleaning tips to keep them fresh and germ-free so you can continue to enjoy them for years to come. Ready? Let’s first take a look at what not to use when washing your flour sack towels. 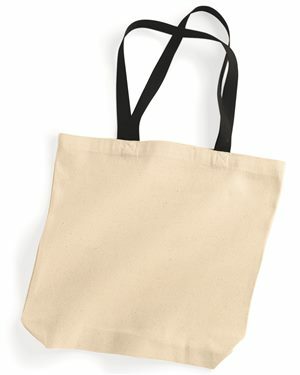 You may feel tempted to bleach your flour sack towels to cover up stains and make them look new. However, before you reach for your bottle of bleach, realize that you might be doing your towels a disservice. 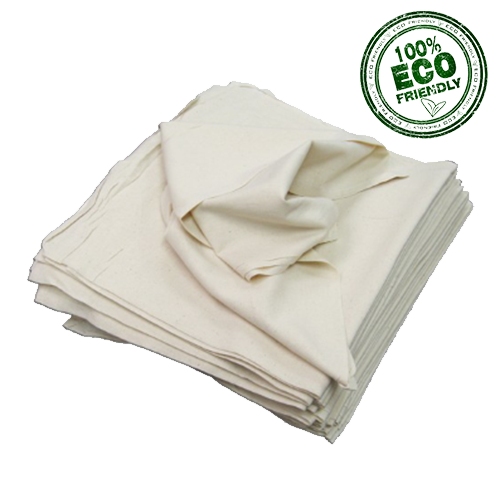 Many commercial fabric whiteners are made with chlorine bleach, which damages the natural fibers of flour sack towels over time. 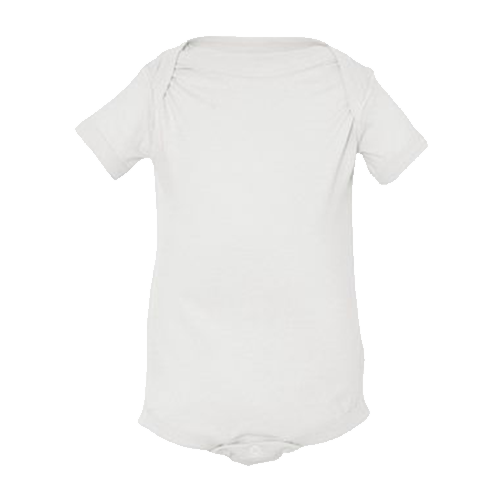 Even diluted chlorine solutions can weaken cotton fibers and eventually cause holes and tears. The solution? 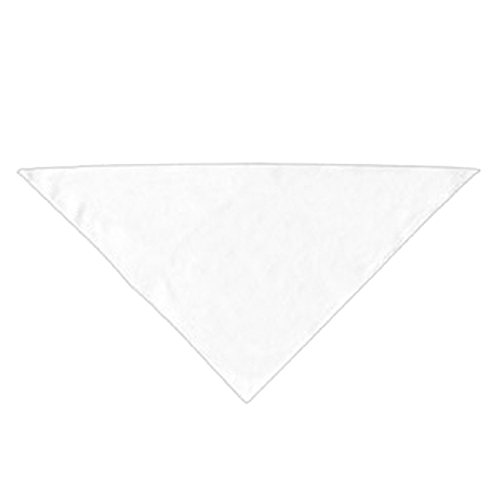 If you want to whiten your towels, look for non-chlorine bleaches made with hydrogen peroxide or sodium percarbonate. 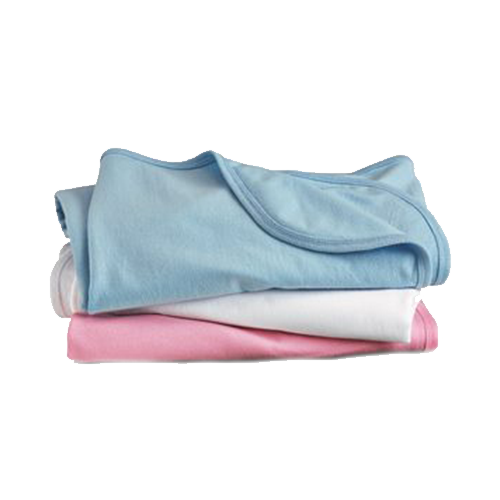 These options are better for your towels as well as your health and the environment. Hydrogen peroxide is also a good option for disinfecting towels, particularly if they’re used in the kitchen. Also, avoid fabric softener and dryer sheets because they can also wreak havoc on the quality and effectiveness of flour sack towels. Fabric softener and dryer sheets leave a wax-like residue on the towel that builds up over time and creates a thick coating, preventing the towel from absorbing liquid as it should. The coating also can trap moisture inside the towel, keeping it from drying properly and trapping mildew and other odors. Combine two cups of white vinegar with two cups of water and one-eighth a cup of vegetable glycerin in a glass jar or jug. Stir or shake to combine. Add half a cup of the homemade fabric softener to the final rinse cycle. Or, even easier, simply add a capful of white vinegar to the rinse cycle for soft, fluffy towels. 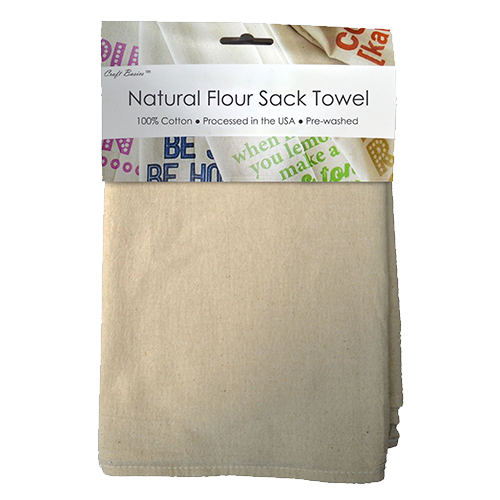 Want to keep your flour sack towels working magic in the kitchen? You can use baking soda and vinegar to keep your towels’ absorbency at a max. Start by putting the towels in and filling your washing machine with water. Once your machine is full of water, add a cup of white vinegar and run the rinse cycle. After the rinse cycle, drain the water, keeping the towels in the washer, and add a half cup of baking soda. Fill the washer with water again and rerun the rinse cycle. After the final rinse cycle finishes, dry the towels completely. 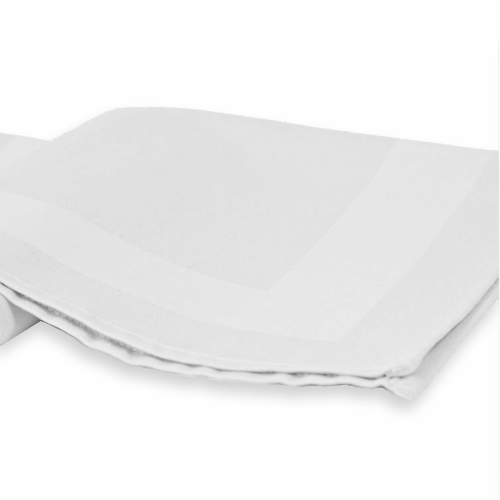 Your towels will now be softer, fresher and more absorbent — ready to tackle any household task. If your towels need an extra cleaning boost or have a strong odor, try using two cups of vinegar and letting the towels soak in the water-vinegar bath for a few hours before completing the wash cycle. Make sure not to add the vinegar and baking soda in the same load. This creates a chemical reaction that foams up and can cause your washer to overflow — think of a science fair volcano. Mix a 2-to-1 ratio of baking soda and warm water in a bowl. 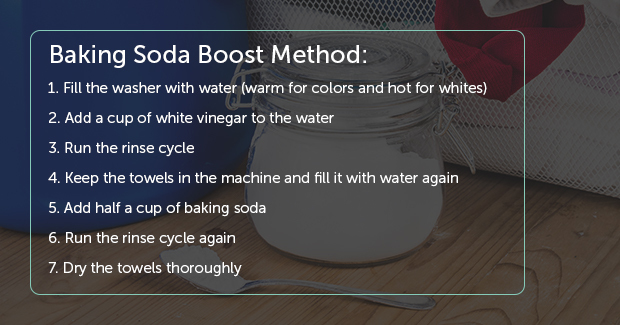 If you use one cup of baking soda, you’ll want to mix it with half a cup of water. If you would like to change paste consistency, feel free to adjust the amount of water you use. 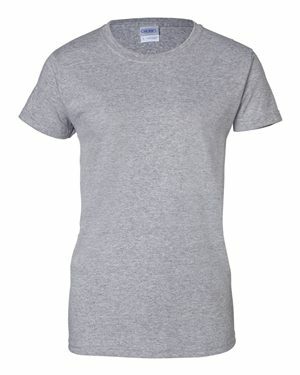 Apply the mixture to the stain before washing. 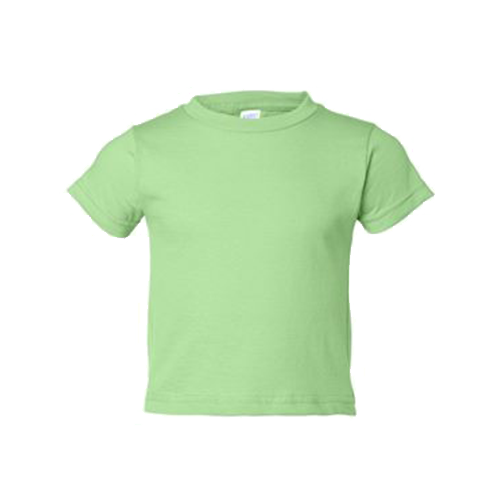 For stains with a strong odor, pour baking soda on the wet stain and let it sit. Brush off excess baking soda before tossing the towel in the washer. If tough stains like those from wine or sauce get on your towel, try to treat the towel immediately. Pour a small amount of baking soda on the stain and then run hot water through the back of the stain. Sometimes, all we need to do is look in the kitchen cupboard for the best cleaning solutions. In the end, we save time, money and prevent chemically induced damage. You can also increase the effectiveness of your towels with careful washing. 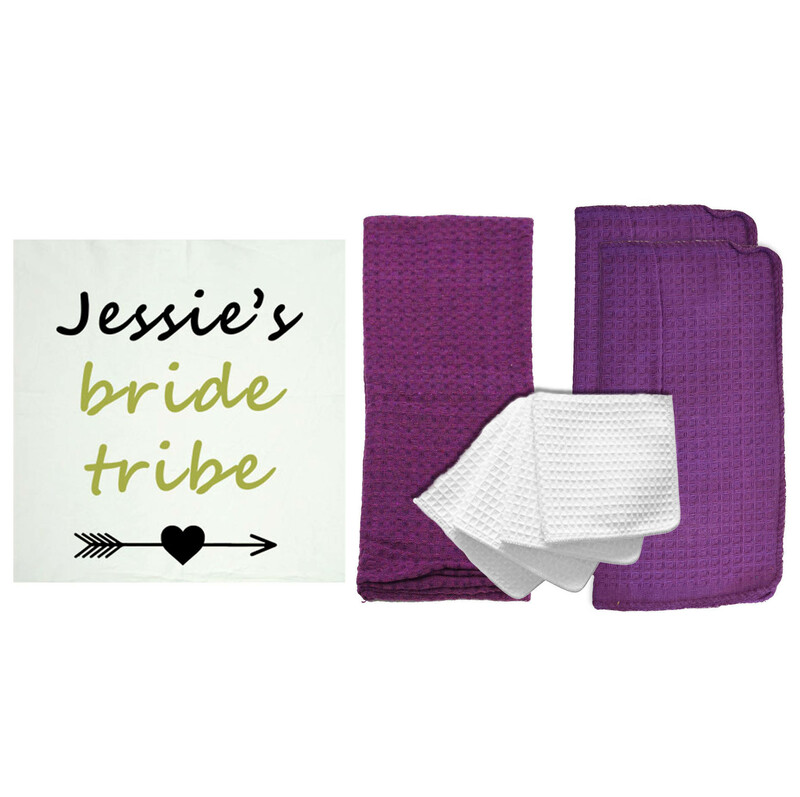 Often before they’re sold, towels are stored compressed in tight packaging, which can make them stiff and wrinkled. 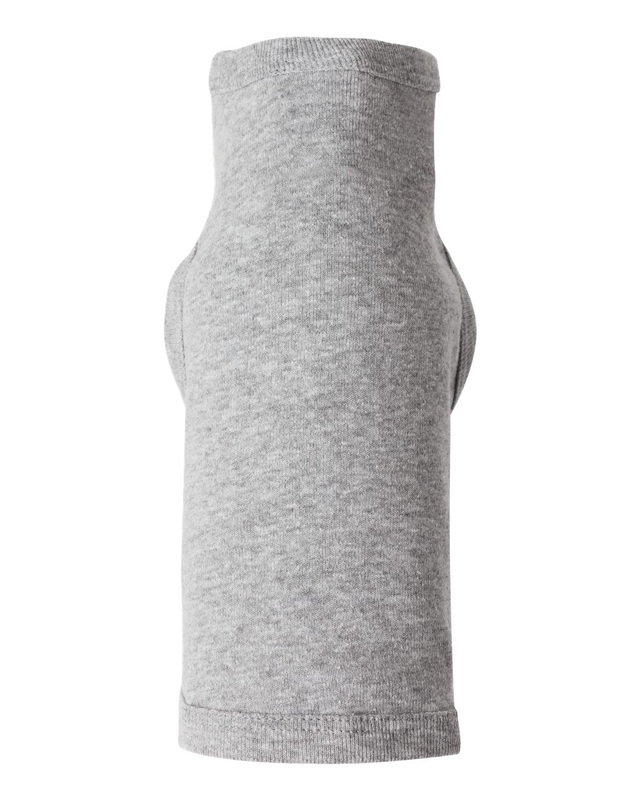 The new material can be a little coarse and isn’t as comfortable on the skin. Always wash and dry towels before you use them. This will increase their absorbency, fluff them out and make them softer to the touch. 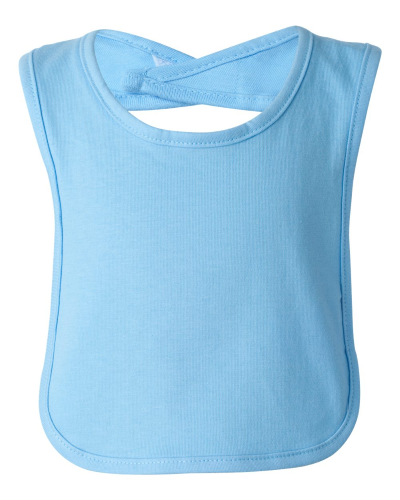 With each wash, towels will become softer and more absorbent. Shrinkage is very dependent on your laundering methods and equipment. If you wash and dry your towels on high heat, you’re likely to see dramatic shrinkage over time. In general, wash your towels with cold water and set your dryer to tumble dry low to keep towel fibers tough. 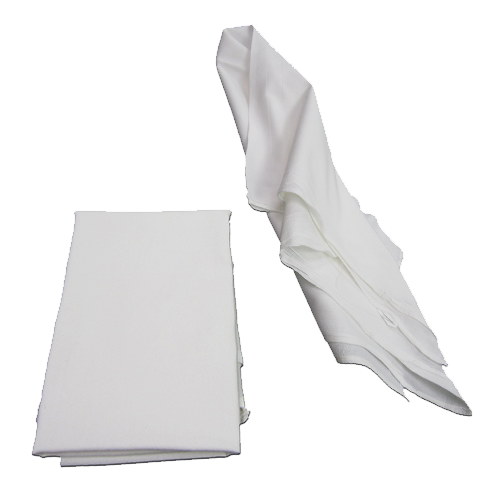 While flour sack towels are extremely useful around the house, there are special hygiene considerations to remember when using them in the kitchen. 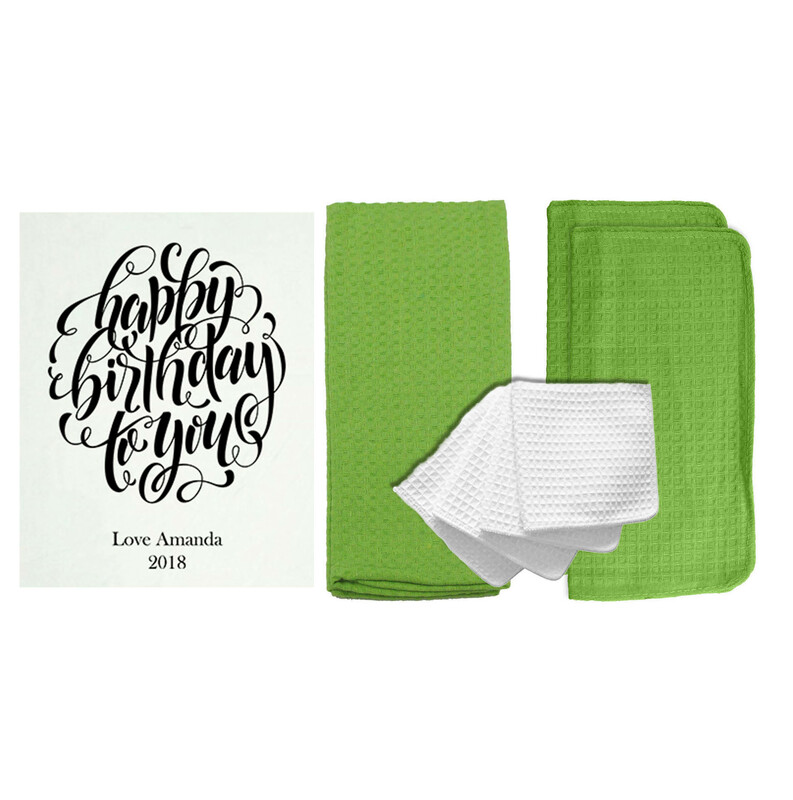 According to the U.S. Department of Agriculture (USDA) Food Safety and Inspection Service (FSIS) and Kansas State University, kitchen towels are the number one source of cross-contamination in home kitchens. With proper hygiene in mind, you can prevent cross-contamination and foodborne illnesses. 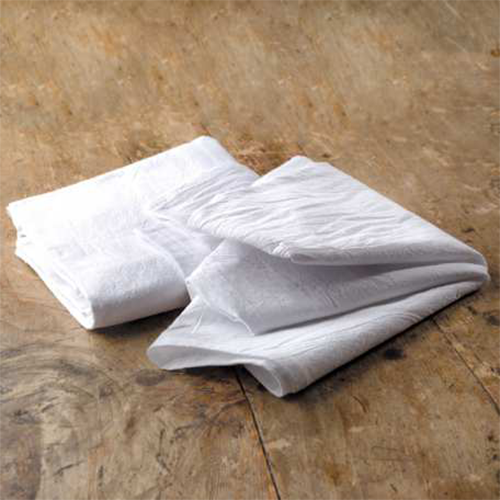 Read the following tips to ensure that your flour sack towels are safe additions to a clean and happy kitchen. Scrub your hands for at least 20 seconds. The aim is to create friction. Dry your hands with a clean towel or air dry. Use paper towels if you can. Make sure you have separate towels for hand drying and dishes to cut down on cross-contamination. With multiple people likely drying their hands on your kitchen towels, it’s all too easy to spread bacteria around your kitchen. Also, be sure to change out towels frequently. Towels build up lots of bacteria after multiple uses. Ideally, you should wash or disinfect your kitchen towels after each use. 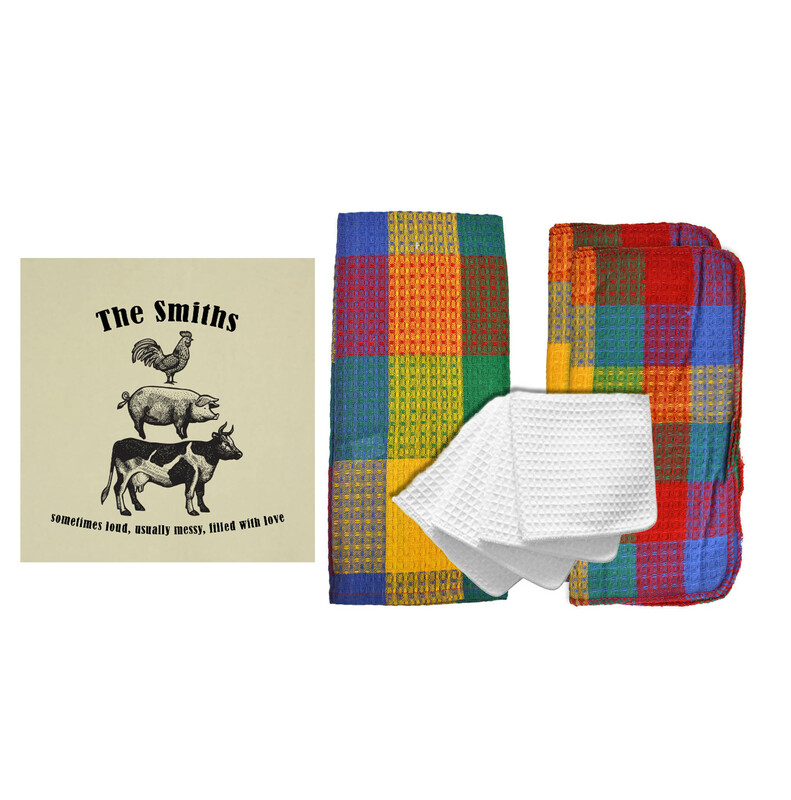 Have a stock of kitchen towels available so you can switch out towels as needed. No matter what, if a towel encounters food, wash it immediately. Never put towels on surfaces where meat is prepared, as these surfaces have loads of bacteria that can infect your towel. Even if the towel is only used around food, it’s still best to wash it frequently. Rinse towels thoroughly before putting them in the washer to remove excess dish soap or dirt. Wash only with other dish towels. Use hot water and a regular cycle. If you are not going to wash laundry right away, do not let wet towels sit in a hamper as this can cause mildew growth. Instead, let them air dry completely before tossing them into a laundry basket. Make sure towels are completely dry between uses. Don’t throw towels on countertops or hang them where they touch countertops. Hang towels on a hook to make sure they dry completely and quickly. Do not layer towels on the same hook. 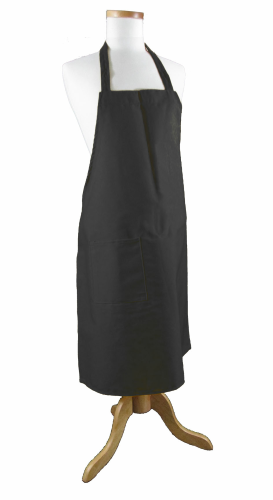 Store towels away from food preparation areas and the sink, since these spots have the most germs. Add a pull-out rack to the inside of a cabinet to keep towels dry and organized. If you don’t have available cabinet space, add wheels to wooden crates to make storage space on the floor. Paint a crate a cheery color to add a splash of happiness to the kitchen or bathroom. Use a glassware hutch to store neatly folded towels. Have fun finding pretty handwoven baskets or antique bins to store rolled or stacked towels. Add hooks or drawers to a cabinet so you can hang towels inside. Use a vintage ladder to hang towels and spark conversation. Get creative with antique wall hooks — a great complement for flour sack towels. A study conducted by the Hygiene Council found that a counter-wiping cloth is the third germiest place in a home, with 134,630 bacteria per square inch. 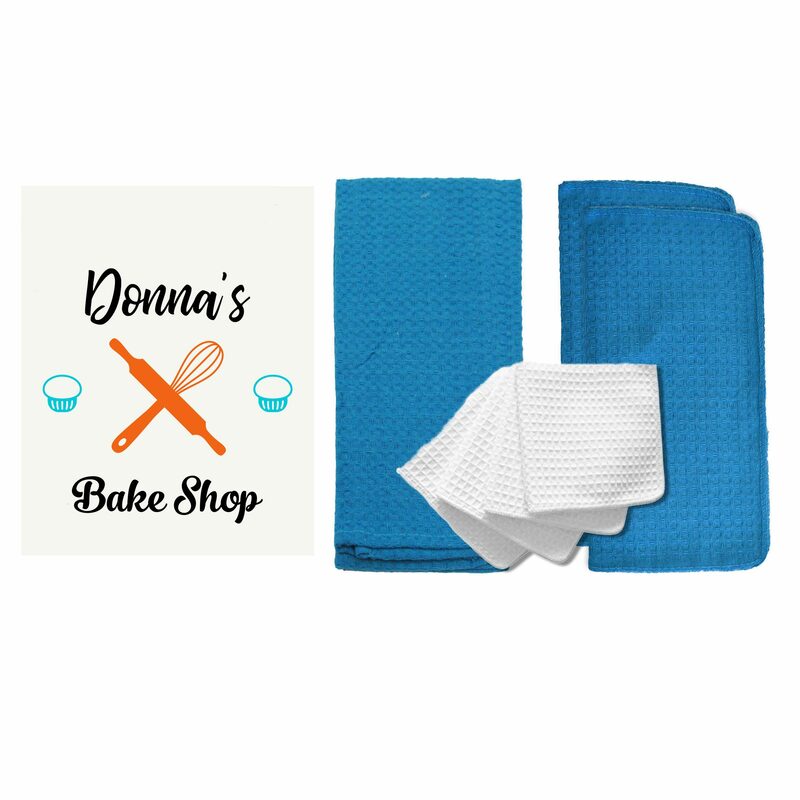 So even though flour sack towels can be your best buddy in the kitchen, from washing the dishes to soaking up spilled milk, it’s important to wash all kitchen towels regularly so you can enjoy your home germ-free. 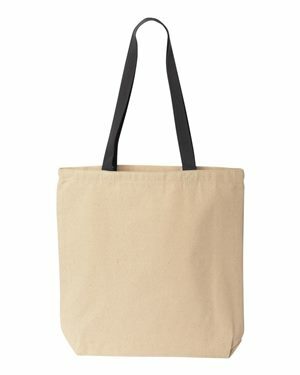 Now that you know how to clean flour sack towels, it’s most important to remember to avoid using harsh chemicals like bleach and fabric softener, and instead treat them gently with easy homemade alternatives. You’ll save on detergent costs, and you’ll extend your towels’ lifespan. 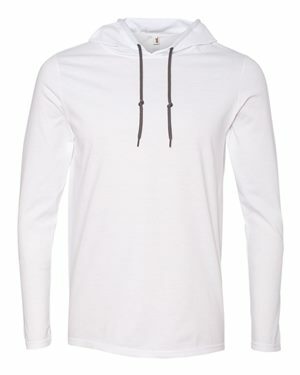 Air dry them when you can to prevent rough treatment in the dryer, and make sure they are completely free of moisture before you store them away. 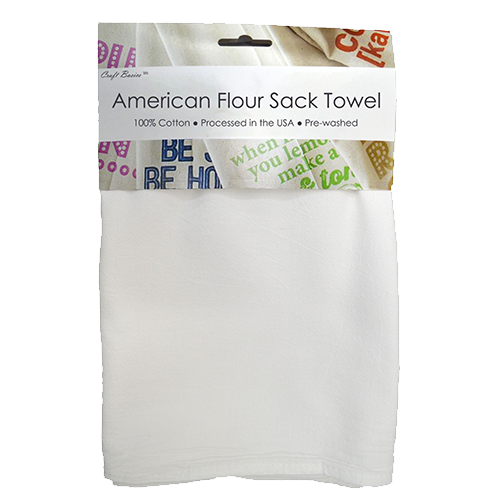 Whether you use flour sack towels in cleaning or craft projects, with gentle care, they can last you a long time. 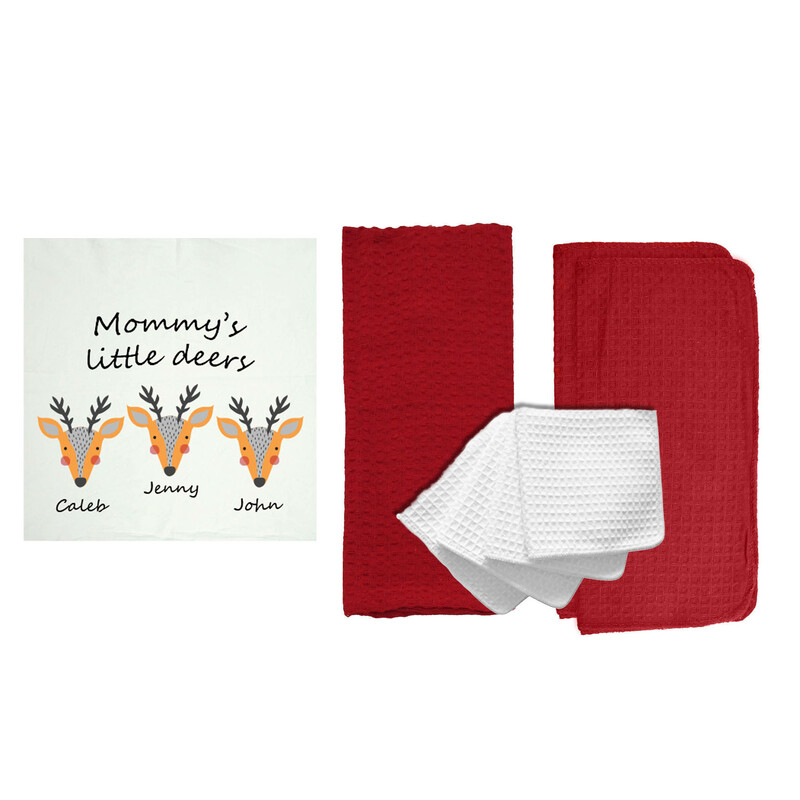 Visit Cotton Creations today for more ways to use your flour sack towels or to find the best flour sack towels for your home.